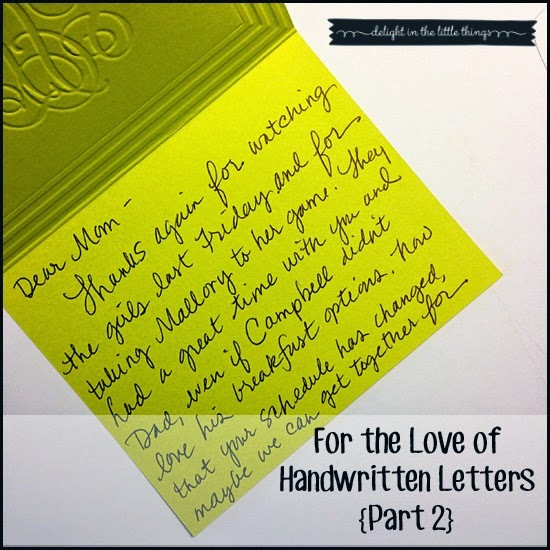 This is the second part in a series about handwritten letters. Read the first post here. Handwriting has always fascinated me. I used to check out books on Graphology from the library when I was a kid, hoping to glean some insight into myself by how I formed my letters. I loved when we learned cursive in school and I practiced and practiced, jealous of my best friend's lovely writing, and often emulating one of my favorite teacher's. In fact, I form my capital "T" exactly the way my sixth grade teacher, Miz C, wrote hers and I sometimes think of her when I write my name. Handwriting is personal. I love how you can instantly recognize a note from someone based on their handwriting. My husband's somewhat-girly cursive (don't tell him I told you), my mother's wide, big teacher-hand, my dad's small, cramped and somewhat dad-ish. I love noticing the differences between my two girls' lettering, probably exaggerated because one is a lefty. In fact, did you know that a person's handwriting can reflect up to 5,000 different personality traits?! No wonder handwriting is often used in forensic crime solving. If you are into this sort of thing, The Definitive Book of Handwriting Analysis looks like an interesting and well written book. We found this awesome infographic which gives some insight to what our handwriting says about us. It's really awesome, but also super long. The original is on National Pen's site and it's worth a read! I also love this video which goes through and shares differences in the formation of letters and what that could mean about the writer. Are you fascinated by handwriting? What do you think your handwriting says about you? Follow our Pinterest board, just write, to find more inspiration for your own handwritten letters. Follow Sassafras Paper's board just write on Pinterest.